Mission on Mission got off to a slow start on Friday night. Making my way down Mission Street, I couldn’t figure out my next location. Though the sign read “Tacos Santana Bar and Grill” on first pass I couldn’t tell if this spot was a bar or if it was restaurant with “bar” conveniently added to its name. After a few trips up and down Mission Street in the car I finally pulled over and took a quick peek inside which revealed a bar with alcohol shelved—decision made—Tacos Santana fit the bill. 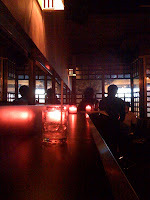 Along my journey there haven’t been many questions about whether I was visiting a bar or sitting in a restaurant. So far I have only encountered one place that occupied that ambiguous territory between bar and grill— Playa Azul, which I concluded after a delicious shrimp tostada, was more restaurant than bar. With checkered black and white tile along its foundation wall reminiscent of old school diners and a gleaming, expensive looking die cut aluminum marquee with lights, Tacos Santana has an impressive exterior that serves as a beacon to late-night patrons in need of sustenance or perhaps a final beer or margarita after a night of partying. Entering the bar side of the establishment I was immediately surprised by the brightness coming from the three TVs—each playing “Caballo a Caballo” some kind of Mexican comedy from the 50s or early 60s. The walls were mostly bare with the exception of a Mexican sombrero enveloped in Miller Light logos which hung high above a mirrored wall and just under the various white orbs that dangled from the high ceiling. Across the aisle from four cocktail tables was a short bar with five or six stools. Service was swift with four waitresses in tight jeans and high heels circling tables on both sides of the room—serving up drinks, food and company to those in need. 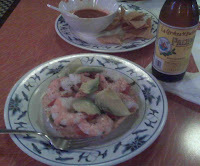 Along with a Pacifico, I ordered two shrimp tostadas to help stave off my hunger and quench my thirst. What quickly followed were a bowl of tortilla chips and some bland, ketchup-like salsa. 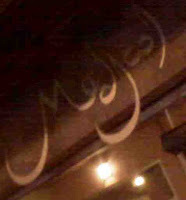 The passing waitresses were attentive and quick to deliver drinks and food. The shrimp tostadas that followed the sub-par chips and salsa were pleasantly delicious. Crisp but not crumbly, the tostadas supported a plentiful amount of shrimp and fixin’s. Though the service and food were good I was bewildered by the check—two Pacificos and two shrimp tostadas came to a hefty $18.50. Next time I’ll gamble on the burrito to save a little dough. 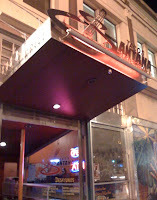 Tacos Santana is a great post-night-out spot for some good eats if you can stomach the prices. 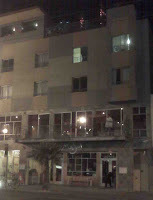 The place doesn’t have much personality and its interior décor is lacking but after a night of drinking does it matter? As far as bar vs. restaurant? I am undecided. Tacos Santana continues to linger in between. Mission on Mission’s next stop cannot be confused as anything other than a bar. Bruno’s, will be a late night visit and I’m sure to see some interesting action though it will have to wait until the first Friday of December. With the Thanksgiving holiday this weekend, I will have ample time to prepare for what I expect to be an interesting evening. Friday capped my long strange week. After another tough work week this one ended with a celebration of sorts—Halloween. With a forecast for rain and not knowing where my next stop would land me, I struggled to decide whether or not to wear a costume on this night’s Mission. Would it be another Latino bar? A hipster bar? Or, just a local watering hole? 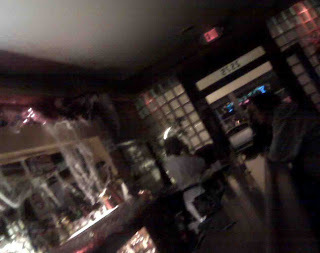 Wearing a mask, even on Halloween, is tough to do at a bar. There’s always that question whether you’re a good guy or bad. (I recently heard an interesting story on NPR’s This American Life about a guy dressed in a Superman costume who went to a bar which was pretty entertaining. Click Here.) I’m sure that Mission on Mission would have been fine with a Lucha Libre (Mexican Wrestler) character cruising the streets. A guy in white tights, blue men’s bikini underwear and blue and white mask with a strategically placed nameplate labeled “Rapido Rapido Magico” would have been quite the sight to see. Alas, I opted to go incognito, but I have included a picture to satisfy your curiosity. Walking down Mission Street I was amazed by the activity in the street. The Mission is always busy on Friday nights but I’ve never seen it quite like this! 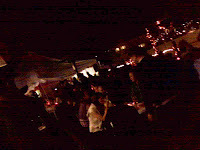 Crowds of people of all ages cruised up and down the sidewalks. Parents escorted their costumed kids from storefront to storefront trick r’ treating, which a motley flow of folks dressed in work attire or their Halloween best zipped up the 24th Street BART station’s escalators on their way home or ready to hit some Halloween festivities. The mood on the street was both spooky and joyous on this windy autumn night. 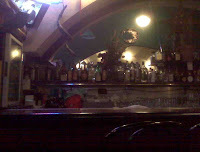 The bar de jour turned out to be Doc’s Clock and I knew right away that it was a good find. I was greeted at Doc’s Clock by two women dressed in black handing out candy to the continuous stream of kids. With knickknacks and tchotkies adorning the walls, Doc’s had a distinct trailer park feel with an extra layer of Halloween décor. Settling into my seat I selected a Big Daddy as my beverage of choice. 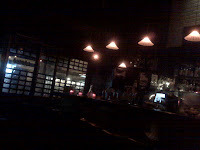 Inside the dim bar with rock music booming in the background and Halloween night all around me I never expected that this would be the place where I’d hear a ghost story—sort of. I parked myself next to a friendly bunch of folks who were pre-partying before heading out to a handful of parties but it was a South African gentleman who I ended up chatting with for most of my visit. Hailing from South Africa he didn’t understand Halloween or why it was celebrated so I gave him my two cents. The talk of spooks and costumes inspired him to tell me a story about being cursed by witchcraft as a teenager in South Africa. Completely intrigued I peppered him with questions. A neighbor cast a spell him to make him unhealthy, self conscious and unpopular. To reverse the hex he had to confront that which he feared most… God. The story became a fable of sorts about finding salvation by confronting and accepting God. That’s when it started to get a little scary. Though the story wasn’t my own, I was brought up Catholic—so thanks to a childhood of CDC and Sunday mass, I have a built in “salvation radar” and it was telling me that the point of this story was to “save” me—and that’s not what I was looking for on Halloween or in a dive bar in the Mission. As his story concluded I quickly made my exit. Nice guy but salvation on Halloween is a tough-sell. 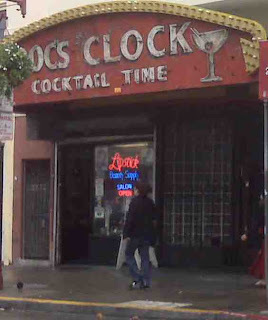 Doc’s Clock is an excellent bar with good service and plenty of activities. Known for its Sunday night happy hour that runs from 8pm until closing, Doc’s hosts a weekly shuffleboard tournament as well as special events throughout the month. One offering that peaked my interest was the “Barbie Mutilation Night” which took place a couple months ago. If a $2 PBR (Pabst Blue Ribbon) or a $3 draft along with some Barbie plastic surgery and contortionism sounds like a good time, check out their website to see the artful additions and enhancements that were made to the little lady and the various yoga-like poses and compromising positions she was twisted into. Doc’s Clock also hosted a big event for Election Night. 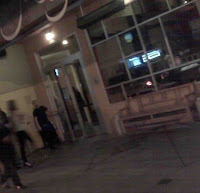 Billed as they Election Night Celebration or the Pity Party– the bar offered a free shot if Obama won. No doubt that was a raging event! As I left Doc’s I caught a glimpse of my next stop, Foreign Cinema. No doubt the next stop will be a start contrast to the relaxed neighborhood atmosphere of Doc’s Clock.